Traction is force applied by weights or other devices to treat bone or muscle disorders or injuries. Traction treats fractures, dislocations, or muscle spasms in an effort to correct deformities and promote healing. Traction is referred to as a pulling force to treat muscle or skeletal disorders. There are two major types of traction: skin and skeletal traction, within which there are a number of treatments. Skin traction includes weight traction, which uses lighter weights or counterweights to apply force to fractures or dislocated joints. Weight traction may be employed short-term, (e.g., at the scene of an accident) or on a temporary basis (e.g., when weights are connected to a pulley located above the patient's bed). The weights, typically weighing five to seven pounds, attach to the skin using tape, straps, or boots. They bring together the fractured bone or dislocated joint so that it may heal correctly. In obstetrics, weights pull along the pelvic axis of a pregnant woman to facilitate delivery. In elastic traction, an elastic device exerts force on an injured limb. Skin traction also refers to specialized practices, such as Dunlop's traction, used on children when a fractured arm must maintain a flexed position to avoid circulatory and neurological problems. Buck's skin traction stabilizes the knee, and reduces muscle spasm for knee injuries not involving fractures. In addition, splints, surgical collars, and corsets also may be used. Skeletal traction requires an invasive procedure in which pins, screws, or wires are surgically installed for use in longer term traction requiring heavier weights. This is the case when the force exerted is more than skin traction can bear, or when skin traction is not appropriate for the body part needing treatment. Weights used in skeletal traction generally range from 25–40 lbs (11–18 kg). It is important to place the pins correctly because they may stay in place for several months, and are the hardware to which weights and pulleys are attached. The pins must be clean to avoid infection. Damage may result if the alignment and weights are not carefully calibrated. Other forms of skeletal traction are tibia pin traction, for fractures of the pelvis, hip, or femur; and overhead arm traction, used in certain upper arm fractures. Cervical traction is used when the neck vertebrae are fractured. Proper care is important for patients in traction. Prolonged immobility should be avoided because it may cause bedsores and possible respiratory, urinary, or circulatory problems. Mobile patients may use a trapeze bar, giving them the option of controlling their movements. An exercise program instituted by caregivers will maintain the patient's muscle and joint mobility. Traction equipment should be checked regularly to ensure proper position and exertion of force. With skeletal traction, it is important to check for inflammation of the bone, a sign of foreign matter introduction (potential source of infection at the screw or pin site). Both skin and skeletal traction require x rays prior to application. If skeletal traction is required, standard pre-op surgical tests are conducted, such as blood and urine studies. X rays may be repeated over the course of treatment to insure that alignment remains correct, and that healing is proceeding. There have been few scientific studies on the effects of traction. Criteria (such as randomized controlled trials and monitored compliance) do exist, but an outcome study incorporating all of them has not yet been done. Some randomized controlled trials emphasize that traction does not significantly influence long-term outcomes of neck pain or lower back pain. "Cervical Spine Traction." In Noble: Textbook of Primary Care Medicine, 3rd ed.Mosby, Inc., (2001): 1132. Glick, J.M. 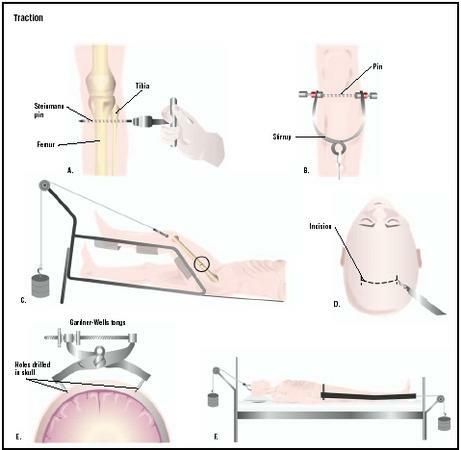 "Hip Arthroscopy. The Lateral Approach." Clinics in Sports Medicine 20, no.4 (October 1, 2001): 733-41. Overly, M.D., Frank and Dale W. Steele, M.D. "Common Pediatric Fractures and Dislocations." Clinical Pediatric Emergency Medicine 3, no.2 (June 2002). How long will traction be required? What is the goal of traction? What is the chance of complications? this site is very effective and good.it helps a lot and give much benefits to surgeon. complication broughtabout by traction as fracture management. it is a verry good site.it help me to prepare my project. THE ARTICLES IN THIS SITE ARE VERY INFORMATIVE WHICH HELPED ME A LOT IN MY IN SERVICE EDUCATION. whats the principle of action of skeletal traction..? how does it work..? I mean from the physiological and pathological point of view..! plzz...my boss keep asking me this question and I have NO clue where to find the answers.! what are the body parts involved in skin traction and their function?? How is traction related to nursing course? what physics concept applied it? "Cervical traction is used when the neck vertebrae are fractured." Isn't this a contraindication to perform traction. Q: Cervical traction is used when the neck vertebrae are fractured? whatis nursing intervention for patient with traction? if there are other types, mention . traction is a set of mechanisms for straightening broken bones or releiving pressure on the spine and skeletal system.A VERY GOOD ARTICLE. we need the traction's catalog which efect on BACKBONE. could you please tell me do youu have any thing in this area? this article really help me. i will apply this teory in my practical area.thanks a lot..
it is short and precise article. It guided me in my orthopaedic experience. Thanks.this article help me a lot but what is a care of skin traction.? what are the complications of traction? And how to treat and prevent them?? this site is so helpful for me in my assignment. but what are the management of a child in traction? what are the nursing management for the patient on skin traction? How do I calculate the traction weight to be applied. Is it reliable that 18 kg weight can be applied in skeletal traction? Why should weight for skeletal traction hang free?